American University Washington College of Law is an institution with a unique heritage. It was founded over 120 years ago by two pioneering women - Ellen Spencer Mussey and Emma Gillett - at a time when women were generally excluded from the legal profession. The founders created a tradition of providing opportunities for those historically outside the mainstream of the legal profession. They also believed that lawyers had a crucial role to play in the development of society, business, government, and individual freedoms. Their extraordinary foresight and perseverance has formed the foundation for this law school. Over 120 years later, as a center of educational scholarly excellence, where women and men from all backgrounds continue to pursue the founders' mission, WCL is a testament to these women's ideals and tenacity. In 1895, Delia Sheldon Jackson, an aspiring attorney, requested that Ellen Spencer Mussey apprentice her as a student of law. At that time, the opportunities available to women in the legal profession were very limited and few law schools admitted them. 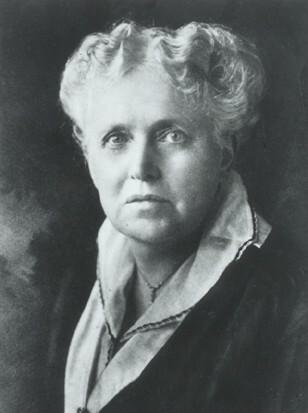 When serious minded, earnest women year after year were denied the privilege of entering the white schools, these two pioneers realized that out of their experience a service to others was possible and they decided to do what they could to open the door of opportunity in the legal profession to women. Mussey herself had undergone legal training in her husband's law office and because of her gender, was later denied admission at the law schools of National University and Columbian College (now The George Washington University). Realizing both the significance of the opportunity as well as the magnitude of the task, Mussey sought out the assistance of her colleague and friend, Emma Gillett. 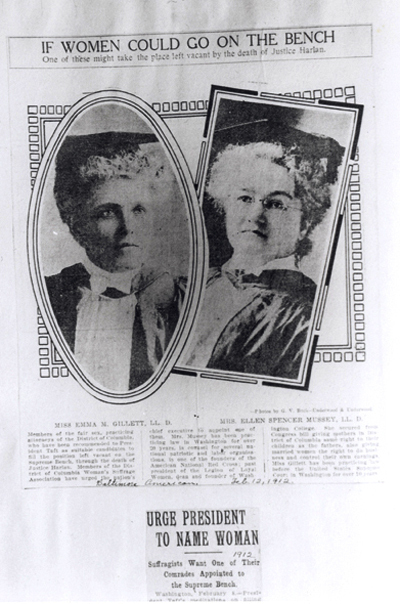 On Feb. 1, 1896, Mussey and Gillett held the first session of the Woman's Law Class as it was then called, enrolling Jackson and two other women, Nanette Paul and Helen Malcolm. This date is officially recognized as the founding of the Washington College of Law. During the early days, classes were held in Mussey's law offices, where she taught Constitutional Law, Contracts, and Personal Property, while Gillett taught Blackstone, Bill and Notes, and Domestic Relations. Within a few years, the program expanded quickly as more women sought to pursue a law-related career. In order to meet the growing needs of the program, as well as to maintain their full-time practices, Mussey and Gillett obtained the teaching assistance of several prominent Washington attorneys. 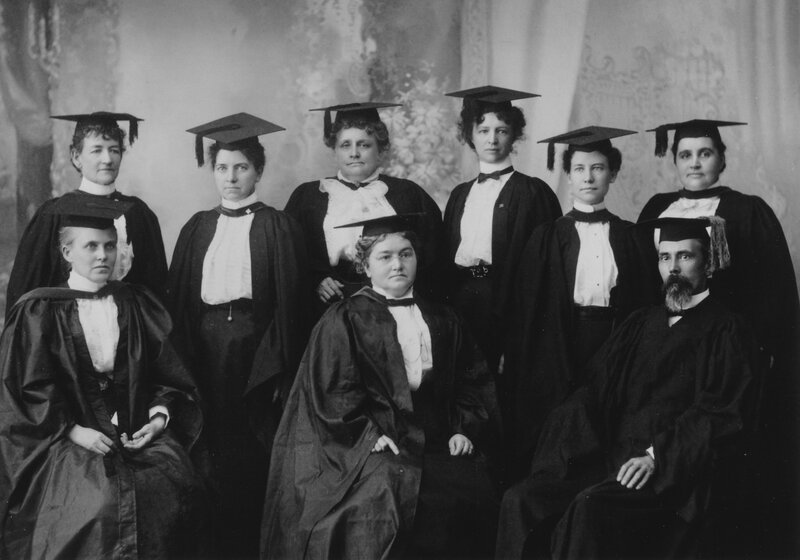 With the help of the new faculty, the programs' curriculum expanded, and by 1898, six women were ready to enter their senior year of study. Not intending to create a full-fledged law school, Mussey and Gillet requested the law school of Columbian College to accept the six women for their final year. When Columbian refused the request on the ground that "women did not have the mentality for law", the two women determined to complete the students' education themselves and to found a co-educational law school. 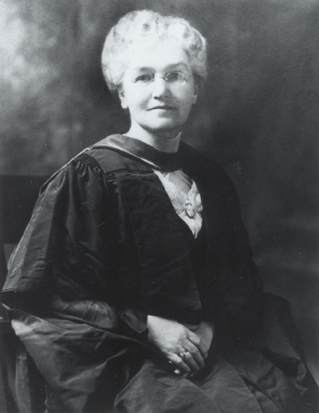 The Washington College of Law became the first law school in the world founded by women; the first to have a woman dean; and the first to graduate an all-female law school class. Significantly, WCL's original articles of incorporation, when it was incorporated by the District of Columbia in 1898, stated, "primarily the college aims to provide such a legal education for women as will enable them to practice the legal profession." It is noteworthy that male enrollment began as early as 1897.